Connie Whitman, radio show host? That’s right!! Join in on the fun at WebTalkRadio! Tune in every week as I am now hosting my very own one-hour radio program called Architect of Change; focusing on work/life balance, attitude, business, success, and more. I look forward to putting my own spin on these topics and will be inviting special guests to join me online for each show. Who among us can define ourselves with just one word? Today people often rattle off their personal information like a grocery list. Mom, entrepreneur, event planner and athlete or Dad, sports enthusiast, corporate officer and author. Wearing multiple hats isn’t easy, finding the right attitude, balance of work and play, and real systems to bring it all together is essential for success. 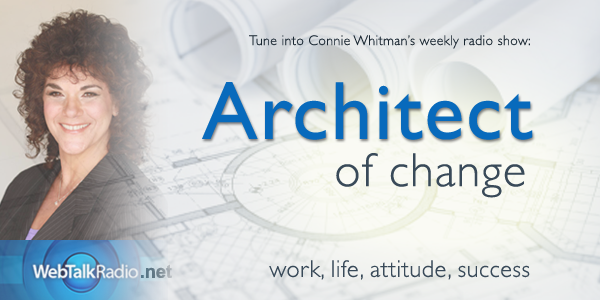 Architect of Change, Connie Whitman has the plans to help you reach your goal. Join her each week for tips and techniques to get you where you want to be! ©2014 Whitman & Associates - All Rights Reserved. Connie has the plans to help you reach your goals! Join her community for monthly tips and insight.